Chevrolet Enjoy: Meet the new MPV from GM! The Chevrolet MPV was showcased at the 2012 Delhi Auto Expo. 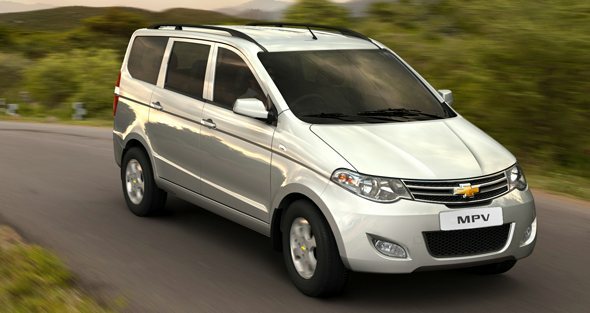 The MPV Concept looks almost production ready as it is the Indian version of the Chevrolet CN 100 (Hong Guang) sold in the Chinese market. The India-bound version has simple, straightforward MPV with the bow-tie Chevy grille. The side-swept headlamps and the leaf-shaped fog lamps give the MPV an elegant look. 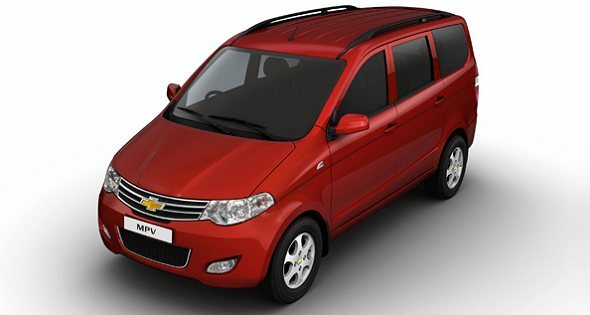 Watch a video review of the Chevrolet Enjoy MPV from Auto Expo 2012 below. Or scroll down to read more. In profile, the Chevrolet MPV bears a typical MPV design. The crease line running through the door handles breaks the monotony of the structure. The large glass house area will likely make the cabin feel airy. The rear of the MPV concept has conventionally designed wraparound taillamps. The interiors of the MPV will feature seven seats and moderate luggage space. The company will also offer the MPV in an 8 seater configuration. Initially, Chevrolet will offer the Enjoy powered by a 1.4-litre petrol engine that puts out 96 bhp of power and 128 Nm of torque. The engine will be mated to 5-speed manual transmission. The diesel version is expected later in the year and will be powered by GM’s version of the Fiat 1.3-litre Multijet engine. The Enjoy is expected to cater to large family buyers, looking for car-like comfort but with seven seats. Pricing of the Chevrolet Enjoy will be a key factor in determining its success in the market. We expect prices of the Enjoy to be between Rs. 6 lakh and Rs. 8 lakh. The Enjoy will compete on a certain level with the Toyota Innova and the Mahindra Xylo, and will face direct competition from the Maruti Suzuki Ertiga MPV, that will be launched in April 2012.